FIRST PERSON VIEW or FPV, how does that work? 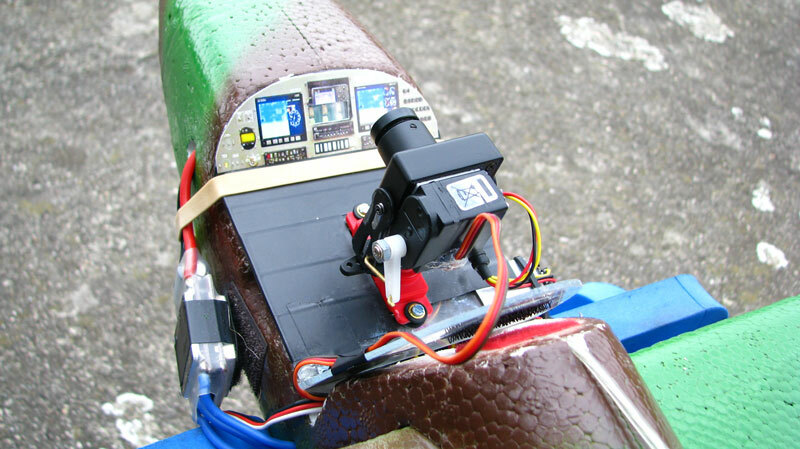 FIRST PERSON VIEW, commonly known as FPV or video piloting, for RC flying means that you can see the images from inside the RC aircraft, via a live video transmission on the ground. You need to use a camera and a video transmitter in the aircraft, on the ground you use a video receiver and link that to a monitor and/or video goggles. 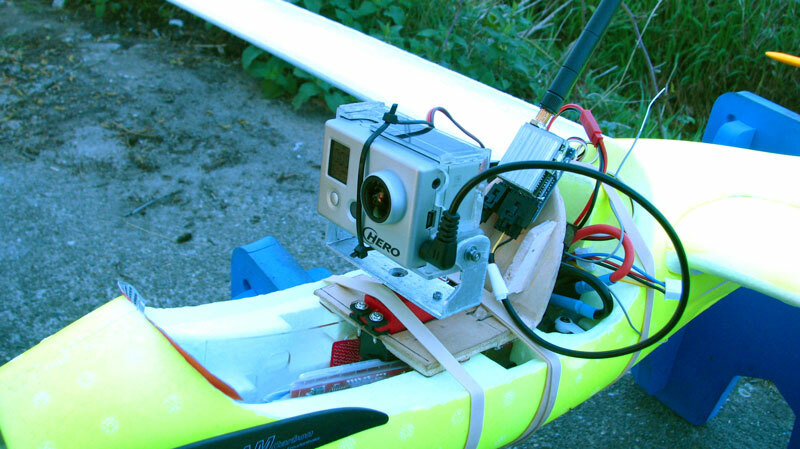 An accelerometer (or GYRO)is attached to the video goggles, that can detect the position of your head and translate this to the movement of the camera on the aircraft, if it uses a pan/tilt system. This will give the viewer a real live view sensation, as if he is actually inside the cockpit. The only thing missing is the G-FORCE, but that could be achieved by using a hydraulic/electric chair, that mimics the attitude of the aircraft and that, combined with the live view, will really create an awesome experience! 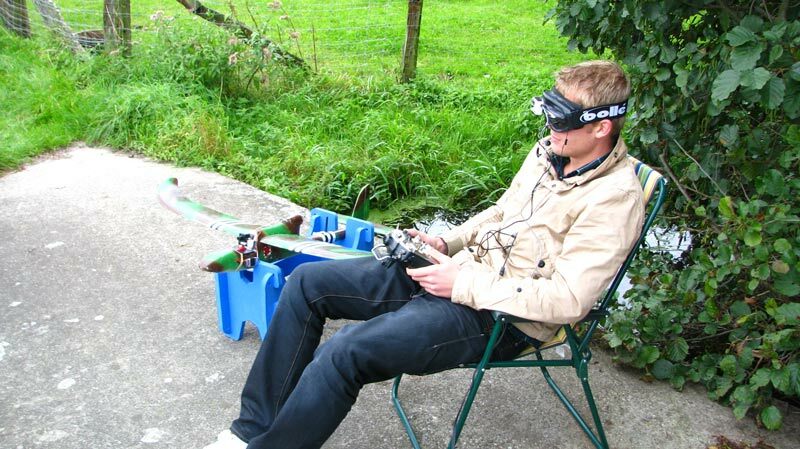 There are many ways to build your own working FPV setup, you can also buy pre-built setups, but it is much more fun to build that yourself. You can use just about any aircraft, as long as it is capable of carrying the weight of the FPV setup and all components should be able to fit inside the aircraft to minimize drag. You should also have more thrust than what is normally needed to fly the aircraft, because of all the extra added weight and drag caused by the camera. One of the most used airplanes in FPV is the Multiplex Easystar, nowadays there are many very similar type of airplanes to be found from Chinese and other manufacturers globally. The Multiplex Easystar is an electric motor, EPP (Expanded Poly Propylene = advanced moulded foam that is durable, flexible, lightweight and repairable) airplane with GREAT flying characteristics, with a pusher motor on top of the airplane, which is perfect since you will not have a propeller in the view of your camera. The best thing to do is build a new airplane for FPV, instead of modifying an existing airplane, unless this airplane has loads of space left where you can easily install all components. Usually new EPP airplanes come in 2 halfs, you can then easily create new compartments inside the fuselage to place the components in and keep the balancing of the aircraft good and also neatly install wiring through the fuselage. This way you have a neat setup without getting tangled wires everywhere with possible RF interference, thus preventing you from crashing all your hard work and expensive setup into a million painful little pieces. But the best thing about this hobby is that you can do it any way you like, with your own budget, your own ideas to modify aircraft, or get influenced by the FPV community on the internet or local RC model club. FPV Multiplex EasyStar, this plane was built before setting up FPV. Therefore you see the ESC on the outside, good for cooling the ESC, bad for aerodynamics. This setup is with a small and lightweight SONY SN555 CCD camera. WHAT DO YOU NEED TO FLY FPV? This is the ultimate FPV starting guide, I will explain what you need. Before you start flying you need some knowledge, skills and components. 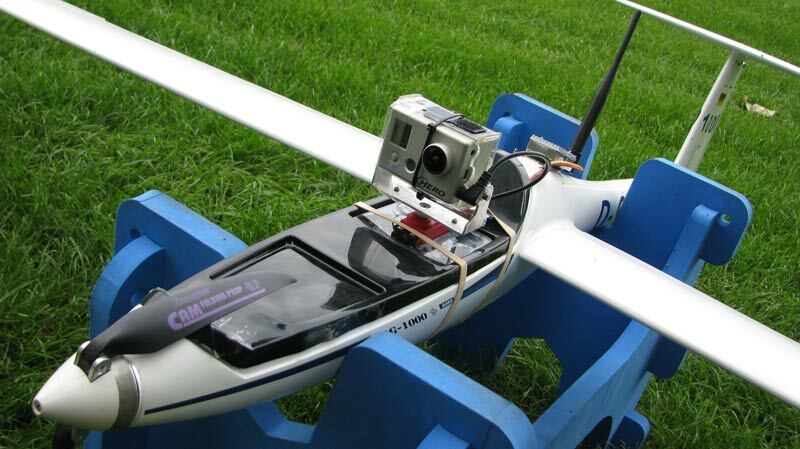 * Experience with flying RC aircraft, you should be able to control it good and understand some basic aerodynamics. * An RC aircraft with enough room to install FPV gear and the motor should give enough thrust to carry the extra weight. * At least a CAMERA, VIDEO TRANSMITTER, VIDEO RECEIVER and VIDEO GOGGLES or MONITOR. * Some knowledge of electronics and you need soldering skills. * The first time you fly FPV, you should have an experienced RC pilot with you, who can act as a spotter and in case something goes wrong he can take over the controls and save the day! Make sure you stay in visual range for the spotter to safely take control. * Make sure you know the area you are flying at, be aware of any landmarks that you can memorize and use for navigation. I suggest to make a flight and record the area, analyze and memorize it afterwards and then go for your first FPV flight. * ESC = Electronic Speed Controller, the device that controls the speed of an electric motor. 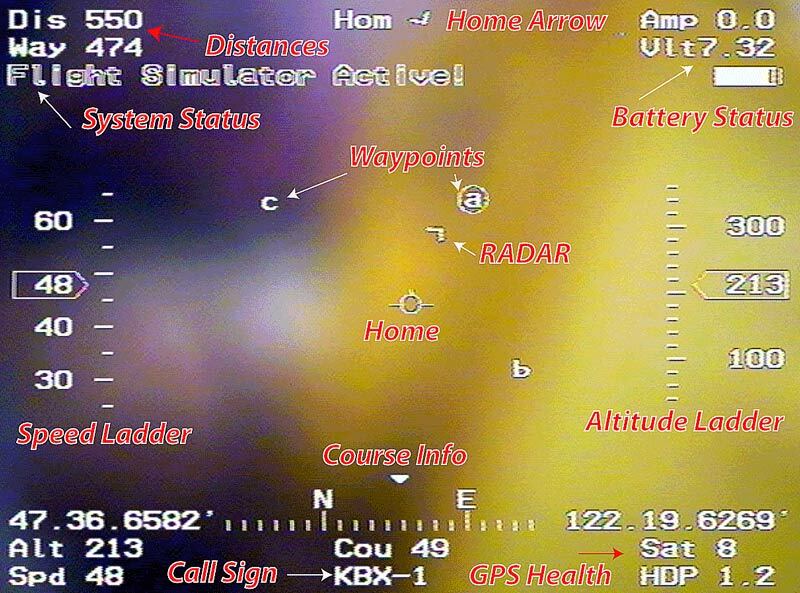 * OSD = On Screen Display, a text overlay through the video feed that displays important info, like altitude, speed, distance, heading, battery info, GPS coordinates and satellite info. * HMD = Helmet/Head Mounted Display, the video goggles. * HT = Head Tracker, often called a GYRO, but it is actually an accelerometer that records your head movement. * CCD = Charge-Coupled Device, type of camera sensor. CCD image sensors are widely used in professional, medical, and scientific applications where high-quality image data is required. * CMOS = Complementary metal–oxide–semiconductor, type of camera sensor. CMOS technology is used for several analog circuits such as image sensors (CMOS sensor), but also data converters, and highly integrated transceivers for many types of communication. This setup is with a heavy/large HDHERO camera. The OSD system is a very handy and almost indispensable tool to have, it shows important information for a safe flight. The OSD system is actually the flight computer that can also control the airplane by analyzing flight data through GPS and onboard accelerometers. This information is fed through the live video feed and can therefore been seen on the ground as a real jet fighter HUD (Head Up Display). Some parameters that can be seen are altitude, speed, heading, distance, satellite info and battery info. This is all calculated by knowing the initial starting GPS coordinates, and then at intervals calculating the difference. Some OSD systems even have a pitot tube system that can measure the actual flow of air passing the aircraft, which is for airplanes more important than GPS speed. There are many manufacturers of OSD systems to be found in the world, another option is a DIY project. The autopilot system can usually take control if the video feed is lost by a flip of the switch by the pilot, or when the RC receiver does not receive a signal anymore from the RC controller and automatically flies back to the initial starting point. This is not only good for getting your aircraft back, but also a safer alternative then crashing in some ones home or even worse maybe injuring somebody. The aircraft would then fly back and start circling above you until you take control again. If the pilot can not regain control, there are even some systems that can actually land the aircraft. But it does not 'see' obstacles so a tree, building or a person can still be in the way of a safe landing. The flight data is sent to the ground via the audio channel of the video transmitter and that data can be used to have an directional antenna on the ground, beaming directly to the aircraft and dramatically increase the video reception range. To view the video feed as a pilot on the ground, we need a monitor or for a more immersive experience, a HMD or simply called FPV video goggles. The video goggles are basically 2 little screens inside a container you put on your head. You will see nothing other than the video feed, this way it feels like you are inside the aircraft, this is a truly amazing experience! Some HMD's are capable of receiving 2 separate video feeds and have them shown one on the left, the other on the right screen. This, in combination with 2 cameras in the aircraft, will give you a 3D view and gives you a sense of depth. You need to have a video transmitter that can either feed and transmit 2 signals, or 2 separate video transmitters. But that can cause a lot of interference with each other, resulting in lines and white noise in the received video. Another option is a WiFi system, that is basically an ethernet PC signal sent from the aircraft and received on the ground, which is then converted to an analog signal. This system is VERY expensive and still very much in early stages of development. There are systems like that on the market, complete with HMD that have an HDMI input in the HMD, so no need for extra digital/analog converters. 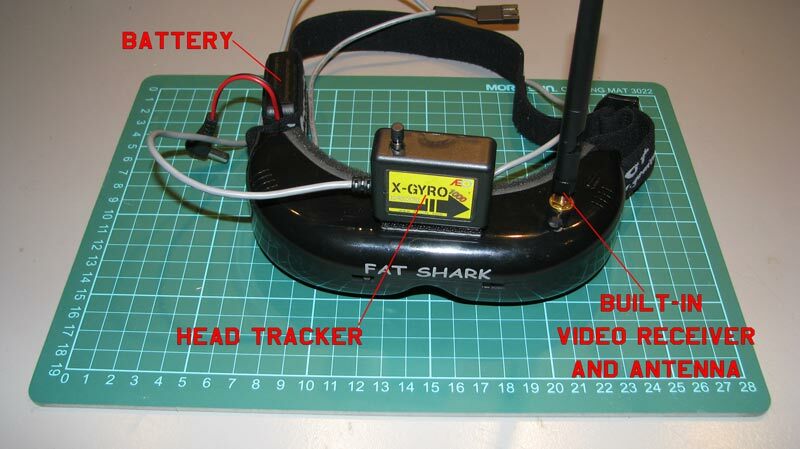 Some HMD's have built-in video receivers and also accelerometers, one of the more known brands in the FPV world is FAT SHARK. 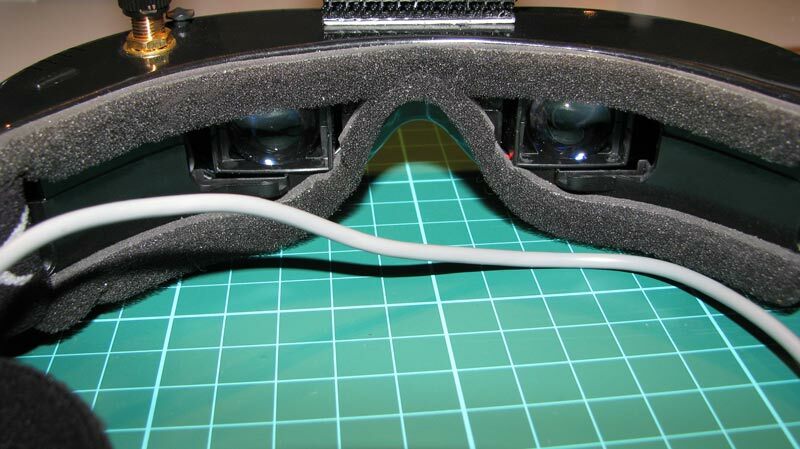 I have built my own HMD using ski-goggles and crafted some video goggles in there, this is to prevent false light to be seen when you wear it. It works really well, but I eventually bought the FATSHARK system myself. * FOV = Field Of View, this is the width of the image you see. A low FOV feels like you have a narrow view, a high FOV gives you more width from left to right, and feels more natural. * Screen resolution = the amount of pixels the little screen or screens in the HMD, the higher the amount of pixels, the sharper the image. This also depends on the resolution of the camera, also keep in mind that if you have an HD 720p/1080p/4k camera, an analog video transmitter and receiver are not capable of sending HD signals. This is where the before mentioned WiFi system differs from the analog TX/RX systems, because it can indeed send/receive HD signals. The X-GYRO box on top of it is the accelerometer for head tracking. The HEAD TRACKER is responsible for sensing the movement of your head and sends this information to the RC airplane controller. This is usually connected to the trainer port of the controller, which enables input on channel 6 and 7, or 7 and 8 and can then control 2 servos for pan/tilt. This way we can control the movement of the camera inside the aircraft to go up/down and left/right. It is often referred to as the "gyro" or "gyroscope", but usually it is an accelerometer or a magnetic field sensor, but sometimes it is actually a gyro sensor. The magnetic field sensor requires you to face North or South to have a centered view, because it uses the Earth's magnetic field for reference. Accelerometers are used to sense both static (gravity) and dynamic (sudden starts/stops) acceleration. With an accelerometer you can sit/stand any way you like, but this system has a tendency to "drift", meaning that you have to press a reset button now and then, or often, depending on the quality of the system and cold/hot weather conditions. Gyroscopes and accelerometers are great, but alone they don’t give you quite enough information to be able to calculate things like orientation, position, and velocity. To measure those and other variables you can combine the two sensors, to create an inertial measurement unit (IMU) which provides two to six degrees of freedom (DOF). There are several systems and manufacturers on the market these days, some have a singular sensor setup, some have combined IMU systems to minimize drift. The drift issue is especially bad when flying low and in close proximity to obstacles, because you usually need to press the button on the actual head tracker to reset it and you have to take one hand off the RC controller. If you have a system like this, I suggest to remove the button and fix it in/on your RC controller. Some have wireless reset buttons via BlueTooth to overcome this problem. 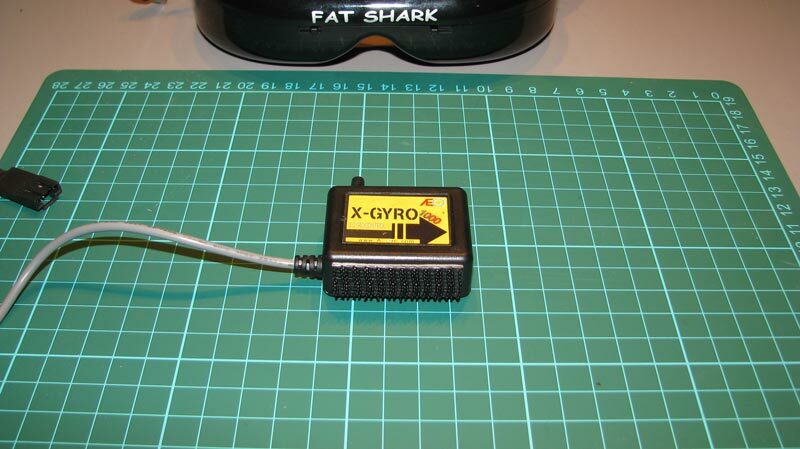 AEORC X-GYRO 1000 head tracker, this is a cheap one with lots of drift. also if a fixed or detachable antenna may be used. Usually a HAM RADIO license is needed! If you want to see the video images live on the ground, a video transmitter and receiver is needed. A small, low power transmitter is installed in the aircraft and a receiver on the ground, connected to a monitor or video goggles, is used to see the live pictures. * 1 x TX aircraft, 1 x RX ground, cable from RX to monitor/goggles. Not easy to move around with the cable attached. * 1 x TX aircraft, 1 x RX ground, the RX is inside the goggles and feeds it directly with no extra cables. Completely free to move around. 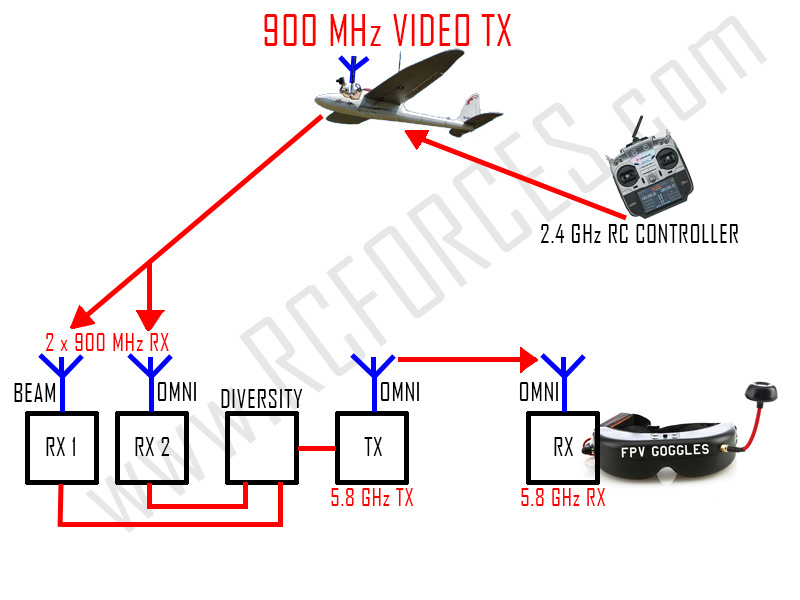 * 1 x TX aircraft, 1 x RX ground -> TX ground -> RX goggles, this is a RELAY setup. The first two setups are perfect for flying FPV in close proximity to you, let's say 1 km/mile distance from you. When you use a "relay" setup, you can use a directional antenna (for long range) and with a diversity setup also a second RX for close range. A "diversity system" consists of at least 2 receivers, that receive the same signal, but the system decides which signal is the strongest/best and passes that through for the pilot to see. You can of course use a direct cable to the goggles, but it is easier to have no cable and by using a second TX on the ground, you can transmit that received signal to the video goggles wirelessly. With the relay setup, you should have those different transmitters and receivers operate in different frequency bands. If you would use the same frequency band you will get interference/distortion in the video signal. The picture below shows an example setup. One receiver uses a DIRECTIONAL BEAM antenna, the other one an OMNI-DIRECTIONAL antenna, more on this in the next chapter. Pros: More range with less power. Less interference from obstacles. Cons: Bigger antenna. Not allowed in many countries (used for cellphones). Can interfere with GPS. Pros: Often a pretty clean band. Smaller antenna. Cons: More interference by obstacles. Shorter range with same power as 900MHz. Close to or in HAM radio band. Pros: Small antenna. Easily available. Small in dimensions. Cons: WiFi, cellphones and other stuff uses that band, high chance of interference. Even more interference by obstacles. Can not be combined with 2.4GHz RC controller. Pros: Very small antenna. Easily available. Small in dimensions. Cons: Secondary WiFi band, antenna SWR (Standing Wave Ratio) hard to get perfect. VERY much interference by obstacles. Some people think that doubling the power, equals double the range. This is not the case, doubling the power only increases the range by +/- 0.4 times. It is much better to invest in proper TX antennas, combined with directional RX antennas. Radio Frequency (RF) power is measured in milliWatts (mW) or, more usefully, in a logarithmic scale of decibels (dB), or decibels referenced to 1 mW of power (dBm). Since RF power attenuates as a logarithmic function, the dBm scale is most useful. More on this topic in the next section. the awesome world of RADIO CONTROLLED AIRCRAFT. and I hope you will enjoy it as much as I do. so other RC enthusiasts can benefit from it. Thank you for visiting my website at RCFORCES. I also share some of my HAM RADIO projects here.